Bacteria are invisible, mysterious, deadly, self-sufficient…and absolutely essential for all life, including yours. No other living things combine their elegant simplicity with their incredibly complex role: Bacteria keep us alive, supply our food, and regulate our biosphere. We can’t live a day without them, and no chemical, antibiotic, or irradiation has ever successfully eradicated them. They’re our partners, like it or not–even though some of them will happily kill us. Allies and Enemies tells the story of this amazing, intimate partnership. 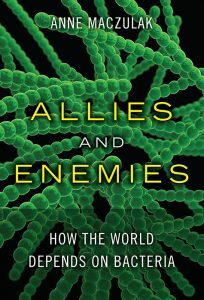 Authored by Anne Maczulak, a microbiologist who’s hunted and worked with an extraordinary array of bacteria, this book offers a powerful new perspective on Earth’s oldest creatures. You’ll discover how bacteria work, how they evolve, their surprising contributions and uses, the roles they’ve played in human history, and why you can’t survive without them. No form of life is more important, and in Maczulak’s hands, none is more fascinating.